Cameras made by Simon Wing are rare and highly prized by collectors worldwide. Wing first learned to make daguerreotypes at the age of twenty and became accomplished in other photographic processes. However he is best known for his studios and innovative multiplying cameras. Mr. Wing helped introduce the tintype process to the public: essentially pictures made on enameled iron. He built the first multiplying camera that made it possible to make numerous pictures on a single plate without removing the plate from the camera. This revolutionized photography by overcoming the problem of making multiple, inexpensive portraits. Interestingly, Simon Wing also helped organize the Social Labor Party in 1892 and was its first presidential candidate. That year Grover Cleveland (D) won the election with over 5.5 million votes. According to two different sources, Simon Wing received a total of 21,000 or 70,000 votes. The Wing New Gem and Ajax were first advertised in 1899 for $8.50 and $12.00 respectively. The New Gem was probably the most popular of the Wing cameras. 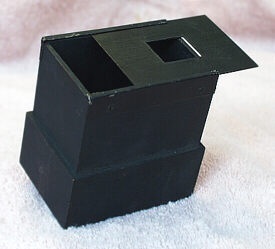 It was built for the inexpensive production of 15 images on a single 5x7 ferrotype plate and up to 28 exposures with internal masks. 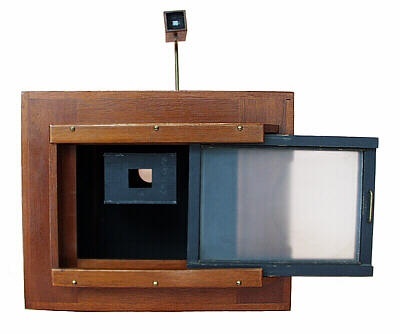 Although strange in appearance with its sliding wood panels and viewfinder mounted on a brass rod, it was an easy to use multiplying camera. 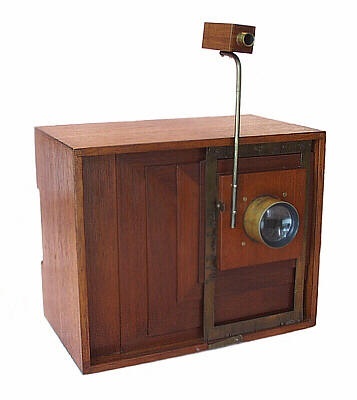 A primitive walnut and brass construction gave the New Gem an appearance of being an older camera but was actually advertised as "new apparatus" in 1901. The camera featured on this page is the lesser known Ajax. It has the same basic features as the New Gem by allowing 4 to 28 exposures to be made on a single plate. While the New Gem used small 1/9th tube lenses, the Ajax was designed for 1/4 tube lens. To accommodate the longer focal length, the Ajax was constructed with a deeper dimension than the New Gem. All New Gem and Ajax cameras used Darlot tube lenses (petzval design). Although the viewfinder shown on the Ajax was made by Wing, it is not correct for this particular camera. A distinctive wood mounted shutter was also available. Multiple exposures are made by sliding the lens panel into various positions in accordance to the appropriate registration marks on the brass frame. Four separate walnut panels act as a type of wooden bellows. A removable holder (right) with mask inserts would determine the size and number of pictures to be made. Without a mask, four 2 x 3 inch images could be made. The mask shown here was used to make twenty 3/4 x 1 inch exposures in a four by five array.